This book sounds really interesting. I've read books about loosing someone close to you and of course I've read teenage love stories, but never one that incorporates it in such a way as You Are Not Here. I'm curious how Annaleah is going to cope with loosing Brian without anyone knowing it and how she'll grow as a person because of this unfortunate experience. I'm also kind of wondering if there will be anyone that did in fact know about their relationship and is waiting in the wings to comfort Annaleah when the time is right. I have a lot of "what ifs" about this book, which makes it that much harder for me to wait all the way until October to read it! 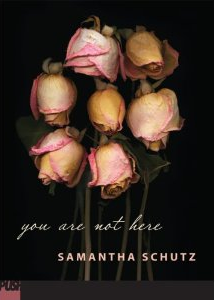 While hearing about this book I also found out that Samantha Schutz wrote I Don't Want to be Crazy which is a true story of Schutz coming to terms with her anxiety disorder. (Feel free to click the title link above for the summary at amazon.) I'm definitely going to grab that the next time I'm out and about. I think it was really brave of Schutz to let us all have a glimpse into the life of someone struggling with an anxiety disorder. It will be interesting to step into her shoes while reading the book.